Make your residence stand out with a new set of flooring from our local store. At Flooring America Ankeny, we offer a full selection of beautiful luxury vinyl flooring in Ankeny, IA, for spaces of all sizes. When you are ready for a replacement for your outdated floors, stop in to see our collection of options. We proudly feature products from top brands for an easy addition to your kitchen, entryway, or living room. Shop with us to enjoy the benefits of luxury vinyl tile throughout your space. Is your home due for a style update? If it has been many years since you last remodeled your space, choosing to replace your floors can make a dramatic change without causing you to undergo a lengthy construction project. Luxury vinyl is made to mimic the appearance of wood, stone, and other materials. Whether you are looking for something modern or traditional, you are sure to find luxury vinyl tile that you love for your residence. Our friendly and knowledgeable sales professionals are happy to discuss the features and benefits of each of our products to make the buying process as easy as possible. We listen to your wants and needs to recommend the right flooring product for every part of the space. Over time, your floors will start to show signs of wear. In homes with children, pets, or other sources of heavy foot traffic, you may notice that your flooring deteriorates quickly. It is important to select a strong flooring product to hold up to this traffic. Is it time to replace your old and outdated flooring? Make the right investment in your home when you choose resilient flooring from our local showroom. 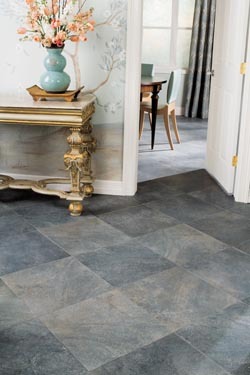 Luxury vinyl tile is designed to handle the wear and tear experienced in the home. You will enjoy a beautiful appearance that lasts for years to come without the need for extensive maintenance. When you have found the right flooring addition for your space, count on our professionals to complete your redesign project. We are available to come to your location to handle every detail of the job. Our experienced contractors proudly offer full luxury vinyl tile installation services for rooms of all sizes. With us on your side, you will ensure every plank and tile is placed properly, eliminating the need for a repair in the future.